dirt arrived in good shape. 1.37g. accurate,reasonable price, fast shipping, will use again. Have panned just a bit, and it is awesome. Very nice. Awesome seller!!! A++++++!! You HAVE to try this paydirt, best on market!!!!!!!! Thank you so much for having this paydirt. Today is my husbands brothers birthday and he passed two years ago. What a perfect day for this to arrive. My husband and his other brother Jimmy stood out in the 20 degree weather to pan today. Not only was the gold in abundance, but it brought so many smiles. I truly thank you. We will add your comments as we get time. Thanks for your patience. Some comments are from our eBay page. You could search eBay for Porcupine Creek Alaska Paydirt or Pay Dirt and read them. we found a gram of gold. Fast, smooth transaction. Highly recommended. Super fast shipping. 1.3 grams of gold. And a heck of a lot of fun! WOW!14 pickers from one serving spoon full!best ebayer! 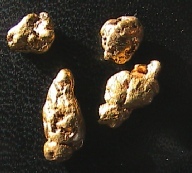 53 peices of gold at 1.3 grams in just the first bag. No fine gold thank you!!! !